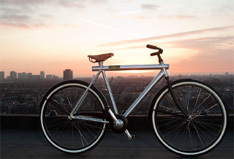 AMSTERDAM, the Netherlands – Last month a new bike brand Vanmoof was launched in metropolises worldwide. The striking as well as practical Vanmoof gent’s bike is specially designed for the city commuter who prefers to move around town fast and fashionable. The Vanmoof cycle is completely assembled in the Netherlands while the frames are produced by Ming Cycle in Taiwan. Depending on the local market, the Vanmoof will be sold via IBD’s, life style shops and internet. “Holland has a long tradition of using bikes for transportation means”, says Taco Carlier. “Even the royal family rides them. The bicycle has been our vehicle of choice since the 19th century and the Dutch are leading experts ever since. The world is catching up and discovers the advantages of going around town by bike. In New York City alone commuting by bike went up 34% from 2007 to 2008 and 170 miles of new bike lanes are created. We think that the bike innovations did not keep up with the urban needs. It was a challenge for us to create a stylish, comfortable and urban-proof bike.